Despite the fact that fatigue and/or sleep disturbance are reported by up to 70 percent of individuals with moderate to severe traumatic brain injury (TBI), there is still limited understanding of their causes as well as a lack of evidence-based treatments. This symposium will present findings from studies of fatigue and sleep disturbance following TBI in order to shed light on possible causative factors, which include factors relating to the brain injury, including cognitive impairments and reduced melatonin production and the injured individual’s psychological problems with depression anxiety and pain. Based on these findings our research group has developed and evaluated three treatments for fatigue and sleep disturbances: Light therapy, cognitive-behavioural therapy and melatonin. Findings from recently completed randomized controlled trials of these treatments will be presented. Jennie L. Ponsford, BA (Hons, MA (Clin Neuropsych), PhD, is Professor of Neuropsychology and Director of Clinical Programs in the School of Psychological Sciences at Monash University and Director of the Monash-Epworth Rehabilitation Research Centre at Epworth Hospital in Melbourne, Australia. 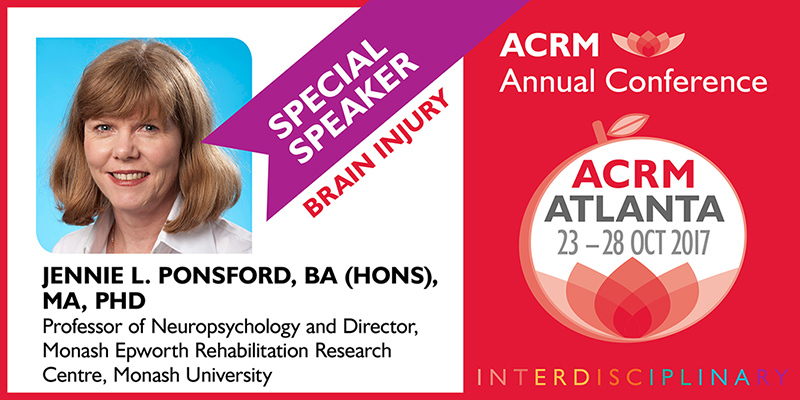 She has conducted clinical work and research into longitudinal outcomes and rehabilitation following traumatic brain injury over 35 years, publishing two books and over 240 journal articles. She is Past-President of the International Neuropsychological Society and serves on the governing boards of the International Brain Injury Association, World Federation of NeuroRehabilitation and Australasian Society for the Study of Brain Impairment. In 2013 she was awarded the Robert l. Moody Prize for Distinguished Initiatives in Brain Injury Rehabilitation and in 2015 she was awarded the International Neuropsychological Society’s Paul Satz Career Mentoring award.